Have you ever thought about the importance of structured cabling and the role it plays in a business? If not, you’ll learn about structured cabling and the value it brings to both businesses and data centers. From added flexibility to redundancy to the reduction of failures and more, structured cabling has the power to dictate how communications systems should be set up in an office. Discover the value of structured cabling, and then contact TailWind to learn more about this solution. Together we can work toward fulfilling your data center needs. Call us to get started. We look forward to helping you. Structured cabling offers a lot of value to businesses that are willing to improve their data centers. They can help add flexibility and redundancy as well as reduce the chances of a data center outage. Additionally, structured cabling allows your hardware to be equipped for change by not binding it to a rigid framework. 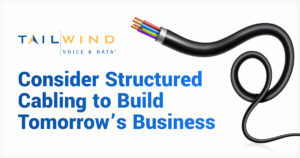 If you’d like to get structured cabling for your business, reach out to TailWind. Our always-on approach to any issues and our ready adaption to your specific needs, make us the right choice for your business needs. Contact us to get started. We look forward to working with you.